Jakarta – PT Pertamina Lubricants, a subsidiary company of PT Pertamina (Persero), which manages the production and processing of lubricants, grease, specialties and base oil products, continues to realise its vision to become a world-class lubricant company with the initial export of Lube Base Oil (LBO) Brightstock 150 (LBO) BS) through TBBM at Kabil Batam. In this mission, PT Pertamina Lubricants will ship more than 6,000 MT LBO BS 150 to Taichan Port, China for PT PetroChina International (H.K) Co., Ltd. 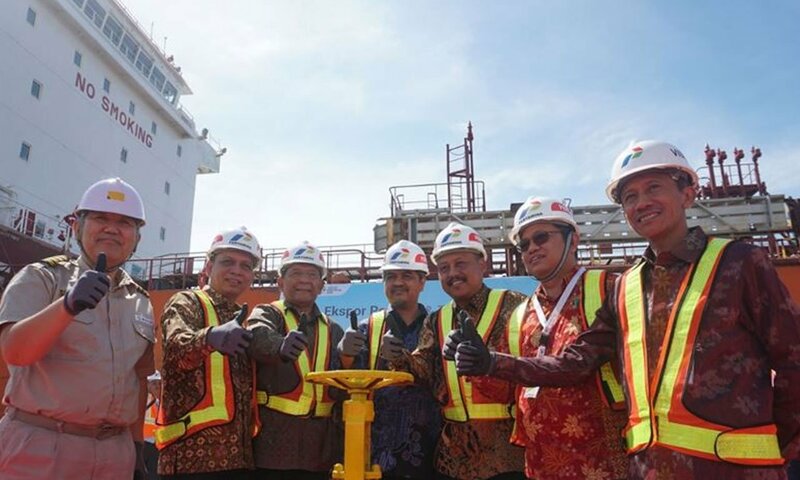 This initial shipment was marked by symbolic valve opening ceremony performed by President Director of PT Pertamina Lubricants Mr. Afandi, accompanied by Head of Sea Port of BP Batam Mr. Nasrul Amri Latif, Commissioner of PT Pertamina Lubricants Mr.Dolly Indra Nasution, Director of Finance & Business Support Mr. Tajudin Noor and Vice President Overseas PT Pertamina Lubricants Mr. Arifun Dholly, as well as Batam local officials. PT Pertamina Lubricants continues to commit in optimising the ability to compete in the international market, especially in Asia. The previous export of LBO BS150 was carried out from Refinery (RU) IV Cilacap to TBBM Kabil, Batam due to its larger stock storage capacity, a more customer-friendly port restriction, such as bulk or vessel exports, and ability to accommodate larger ship specification, such as Ocean Going and Mother Vessel Ships. PT Pertamina Lubricants LBO trading activity increases export trading volume, improves tanker traffic, and maximizes infrastructure in Batam. It also helps in mobilising other subsidiaries companies of Pertamina and local businesses in Batam. LBO Trading activities in Batam is a synergy between Pertamina’s subsidiaries, namely PT Pertamina Lubricants and PT Pertamina Patra Niaga, in cooperation with BP Batam in terms of port infrastructure and tank-farm at Kabil Batam. PT Pertamina Lubricants is committed to realise its vision on every line of business, including enhancing LBO’s trading capacity in regional and international markets. In the future, Pertamina Lubricants will continue to maximise sales and exports through Kabil TBBM, including sales of flexy bag, small party (retail), and IBC of blending and trading. This is in line with the strategy owned by overseas division of PT Pertamina Lubricats LBO Kabil 5.0. “This initial export marks our commitment in processing Lube Base Oil to the international market with greater scale and volume as well as longer distance yet more cost efficient, so it can be more competitive in the export market. In addition, Kabil Batam geographically brings us closer to export-oriented countries, such as in Southeast Asia, China, Middle East, Europe and Australia. We will continue to explore the export business from TBBM Kabil Batam to all consumers in various regions in the world,” said Afandi, President Director of PT Pertamina Lubricants at the opening of the event. Business Automotive Solutions Pty Ltd offers a diversified range of lubricants for commercial, industrial, and marine applications. As an Exclusive Distributor for Pertamina Lubricants, we have been trusted by hundreds of corporate clients in Australia.